Tranquility, relaxation, and luxury are embodied at the Storfjord Hotel. Situated on a hillside overlooking the Storfjord and the Sunnmøre Alps in Glomset, the breathtaking vistas are characterized by snowcapped mountains, deep-blue waters, and green forests. 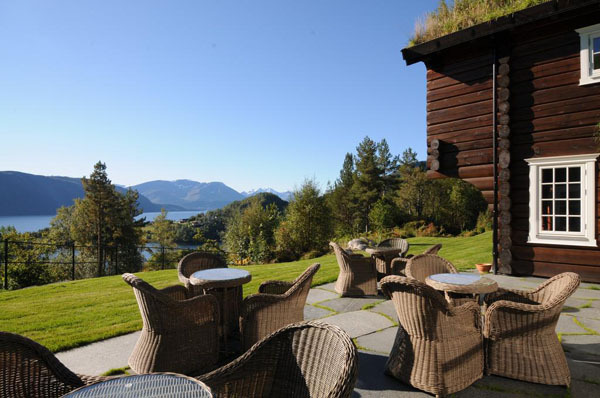 Escape from the hustle of the city and rejuvenate the mind and soul in this idyllic and peaceful Norwegian setting. Behind the handcrafted log walls awaits an experience that you cannot get anywhere else. Each of the rooms captures nature’s beauty and overlook the vast forest or the fjord. Choose from a Superior room, Junior Suite, Corner Suite, and Storfjord Suite. Each spacious suite features a sitting area and a private balcony or a terrace with a view. 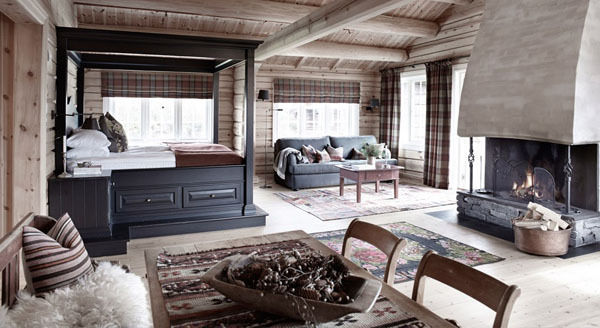 Everything is designed with a Norwegian Alpine aesthetic with pine furniture, small square windows, sheep skin on floors and chairs, sumptuous beds and atmospheric fireplaces- and perfect for a romantic getaway! Indulge in their wellness area and slip into a warm robe and enjoy the view of nature. Everything is decorated in pine and their sauna has a giant floor-to-ceiling window allowing guests to enjoy the spectacular view of the forest while relaxing in the heat. Also, if guests want to smell the crisp fresh air they can enjoy their outdoor Jacuzzi with a spectacular view and is lined with natural stones. Their wellness center is nothing less than perfect and allows each and every guest to relax and unwind in a natural setting. If you are looking for a getaway that combines luxury and nature, the Storfjord Hotel has it all giving another reason to love Norway and all of its hidden attractions.